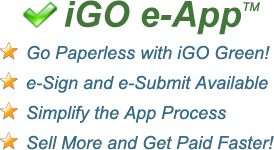 iGO®, an intelligent fillable form, enables producers to improve efficiency and productivity by eliminating errors and producing 100% in Good Order submissions. iGO® is accessible through a single sign-in on The Thompson Agency's Web site. When used with e-Signature and e-Submission, producers execute straight-through processing to speed policy issuance.